Large passenger vans are often used by churches, ministries, and schools for moving people from place to place – but you maybe be putting your passengers at risk for serious injuries. In general, ministries and churches who use 12 and 15-passenger vans for transport are advised to pay greater attention to tire maintenance, road conditions and passenger loads. Large passenger vans produced after 2006 are likely equipped with advanced safety technology (i.e. automatic emergency braking, stability control, tire pressure monitoring) that can help address the risks but vehicles manufactured earlier may not have these features. That’s why, to minimize the risks of roll over and maximize church van safety, driver safety training is of the essence. Originally, 15-passenger vans were manufactured to carry cargo. This means they don’t comply with some of the safety requirements for passenger cars or buses. If you plan to use a 15-passenger vehicle as church transportation, familiarize yourself with some of the issues regarding church van safety. The more people occupy the van, the more weight there is: the passenger weight can then raise the center of gravity, shifting it to the rear of the van. This puts the 15-passenger vans at a greater risk of overturning. The sheer size of the van also makes maneuvers such as changing lanes more difficult and increase braking time. The majority of 15-passenger vans come with single rather than dual rear wheels. This decreases rear traction to the point that a sharp turn can cause the rear tire to slide. Most vans manufactured before 2008 use tempered instead of laminated glass. This can create safety issues as the church van occupants may get thrown out the vehicle if a collision happens. If your church plans on using a 15-passenger van for transportation, it’s a generally a good idea to invest in church van safety. Driver safety training is one of the most effective ways to minimize the risk of accidents and injuries. Make sure you do thorough background checks on any drivers you employ and choose experienced employees with the proper licenses and clean driving records. Introduce specific driver safety training for the use of 15-passenger vans and make it a requirement for all drivers. As a general rule, offer a refresher and repeat the training every year. The National Safety Council provides driver safety training for vans, and the BrightFleet offers a specialized training course for large passenger vans used specifically by churches. Maintenance is of the essence when it comes to church van safety. Inspect the vans tires before any trip and check the tire pressure to ensure they’re properly inflated. The tire pressure may differ between the front and rear tires so make sure to follow the recommendations for tire pressures in your manual. Make sure you also coach your passengers in church van safety. Require that every occupant of the van wears a seat belt at all time by creating a written van safety policy and ensuring your drivers enforce it. 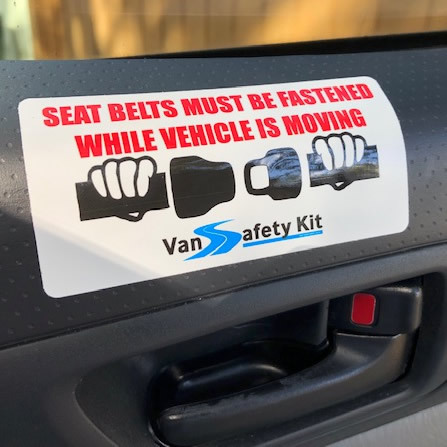 Seat belts need to be inspected regularly and replaced in case any are missing or faulty, and van should be marked to remind drivers and passengers to always wear their seat belts. According to NHTSA’s data, over 85% of fatalities in 15-passenger rollover accidents are due to passengers not wearing their seat belts. The National Highway Traffic Safety Administration warns that the more passengers there are in the van, the higher the likelihood it will roll over. Additional measures you can take to improve church van safety is limiting the number of passengers to 9 and prevent overloading by keeping the back of the van free of any luggage or equipment. Consider also removing the rear seat and encourage passengers to sit in the front of the rear axle. Ensure your drivers drive at a safe speed and take the road conditions into account, and limit drive time to 8 hours per shift. Driving for long periods of time may impair your driver’s cognitive abilities and impair their attention (which is why you should also prevent them from driving during the night). Regardless of the distance, it’s important that you take the above safety considerations into account when driving or using a 15-passenger vehicle. Even short distances can present significant risks: according to government data, 70% of all van accidents happen within a 25-mile radius from the home base. Invest in quality driver safety training and van maintenance to ensure the safety of your church van and passengers.